Jonathan Newell discovers how Hansford Sensors is making vibration monitoring data collection safe in hazardous environments. Condition monitoring in process industries, the oil and gas industry or even in the engine rooms of ocean going vessels can be hazardous due to the explosion risk when connecting industrial data collectors to gather the information the engineers need to analyse. One option to overcome this dilemma is to engage in an expensive and unnecessarily intense continuous monitoring programme with the sensors feeding data out of the hazardous environment directly into data acquisition systems for round-the-clock analysis. For many industrial environments, a snapshot of vibration data is needed periodically in order to be able to detect trends and identify potential problems early enough to avoid costly failures and capital equipment replacements. To find out more about how engineers can overcome the hazards, I spoke to Chris Hansford, Managing Director of Hansford Sensors about the latest vibration monitoring connection enclosure that the company has released. The product that Hansford Sensors has recently released is the HS-ICE enclosure, which provides a compact and self-contained terminal enabling engineers to attach portable industrial data collectors and take readings from accelerometers attached to the equipment being monitored. With a capability of being configured for taking inputs from between 1 and 24 channels, readings can be taken quickly and easily from one central point. In addition to providing a safe haven for data collection by protecting the environment from the data connection, the enclosure provides protection to the connectors themselves and the collection equipment from the surrounding environment. It’s able to do this because the IECEx and ATEX certified enclosure is also sealed to the IP66 standard providing protection from dust and moisture ingress. I asked Chris Hansford about why such enclosures are needed rather than running the cabling out of the environment altogether and he explained that the enclosure is there to provide an intrinsically safe environment for maintenance engineers to attach their data collectors to sample data from instruments used for monitoring processes. “For example, this could be vibration data from motor bearings and the engineer simply attaches the data collector to sample data from the accelerometer. This data is then taken away for analysis and a comparison is made to previously sampled data to detect trends or identify potential problems,” he said. This is different from continuous monitoring. In the case of sampled monitoring, the sensors are predominantly idle and the only available data is that which is sampled at the time that the data collector is connected. The enclosure and this kind of monitoring are often used in hazardous environments of process machinery – oil refining, chemical processing etc. It isn’t used in wide deployment applications with multiple sensors such as wind energy sampling. According to Hansford, apart from refineries, chemical plants and offshore facilities, the HS-ICE enclosure is now also gaining a lot of interest in marine applications. “Maritime is a growth area, for example in cruise ships,” he told me. The maintenance of engine rooms and the air handling and air conditioning plant are typical applications, all of which are crucial both financially and commercially, according to Hansford. 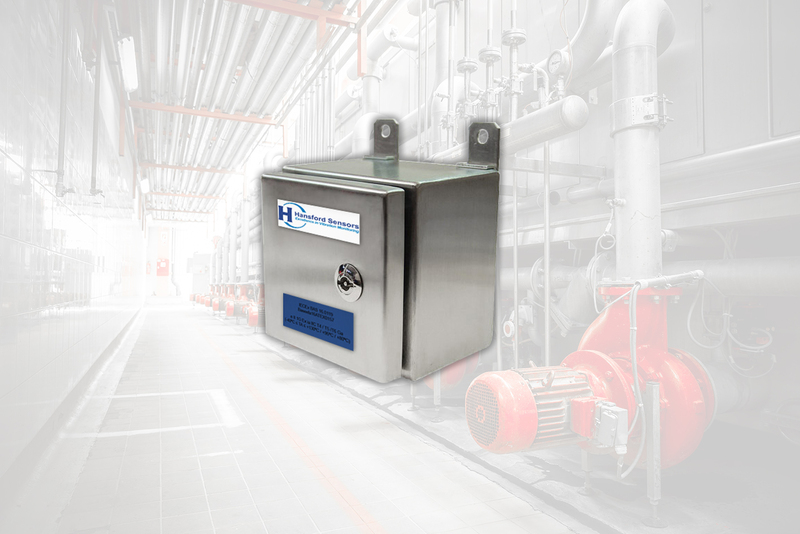 With such growing markets and the increasing need for environmentally safe enclosures, products like the HS-ICE from Hansford Sensors will continue to find new applications to enable engineers to provide a safe haven for connecting their data collectors and providing essential preventive maintenance.